There are so many different sources of information out there about exercising; it’s hard to tell which ones are true and which ones aren’t. 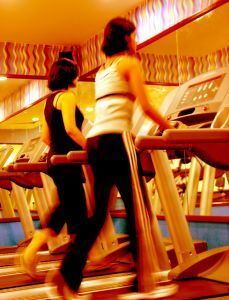 The sooner you learn the truth about exercise, the nearer you’ll be to achieving the results you’re after. If you put a pound of muscle on a scale, and a pound of fat on another scale, they will both weigh one pound. The difference is its size. A pound of muscle will appear a lot smaller than a pound of fat. Muscle is more dense than fat, therefore taking up less space, however still weighing the same. I’ve heard this one so many times, and each time I say the same thing. As women we can’t bulk up like men, the simple answer to this, is that we have too much estrogen in our body, and roughly a third less testosterone compared to what men have. By lifting weights, it will increase lean muscle mass, which burns calories more efficiently, and give you a more lean, tighter physique. When you first start a new exercise programme, you may find you don’t lose weight start away or even maybe put on a couple pounds. The scale isn’t the whole picture. When you first start, you may actually gain some muscle, which will make it seem like you’re not losing any fat. Instead of worrying about the scales, focus more on what you see in the mirror, and how your clothes fit, this will determine any progress your making. No matter how many crunches you do, you’re not going to see your abs unless you’ve removed the layer of fat covering them. You can’t just focus on one body part, imagine if you could, you’d have a six pack with wobbly arms and legs; you’d be out of proportion. Focus on your body as a whole, and slowly you whole body will tone up evenly. By exercising every day, you’re not allowing your body to rest and recover. When you exercise, you are tearing your muscles, and the only way for them to recover and get stronger, is to rest. Overtraining can actually end up making you weaker, making your efforts seem pointless. Aim for roughly 1-2 days rest a week, depending on your fitness level.